You can watch, but shouldn't touch, these for profit colleges. 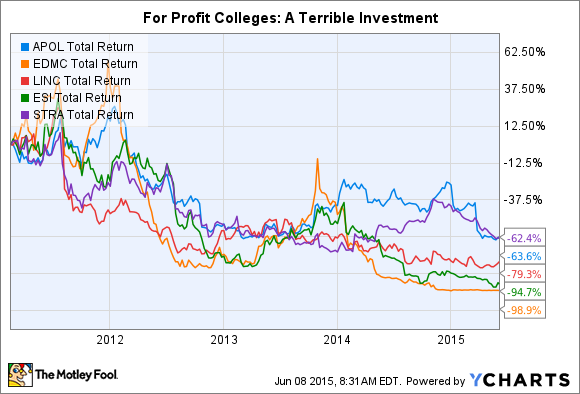 You'd be hard-pressed to find a writer here at The Motley Fool who has spent more time than me railing against for-profit colleges and universities. In 2011, I led off with an article about "Why I'm Staying Away From For-Profit Education." In the piece, I called out six stocks to watch in the industry. APOL Total Return Price data by YCharts. One of those companies, Corinthian Colleges, which I identified as by far the worst of the bunch, is not even on the chart because it closed all of its schools and the stock has essentially gone to zero. Education Management (NASDAQOTH:EDMC) will likely soon suffer the same fate. Taken together, these six have an average return of -83% since February 2011. That lags the broader market by over 150 percentage points and qualifies as one of the worst possible investments you could make over that time frame. Does that mean there are deals to be had? Take a look at the price-to-earnings ratio of some other companies in this industry, and you might be enticed to put your money behind them. P/E = price-to-earnings ratio. P/FCF=price-to-free-cash flow ratio. Source: E*Trade, Yahoo! Finance. But don't be fooled by these numbers, which could be masking serious problems. For example, the Federal Consumer Protection Agency last year charged that ITT Tech "misled students by overstating their salaries and job prospects upon graduation." Just last month, the SEC announced fraud charges against former CEO Kevin Modany and current CFO Daniel Fitzpatrick, saying the two "concealed from ITT's investors the poor performance and looming financial impact of two student loan programs that ITT financially guaranteed." The problems don't stop with ITT. The lifeblood of any for-profit school is enrollment. And the best indicator for future trends is new student enrollment. Here's how the other five institutions fared in this regard during fiscal 2014. Source: SEC filings from most recent annual reports. *Bridgepoint only published total enrollment numbers, and did not break out for new students. While Strayer stands out with growing enrollment, the college reduced tuition for new students by 20% last year -- so the gain in students was nowhere near enough to offset the drop in tuition payments. In the end, the trends are simply not going in these schools' favor, and I don't see that changing anytime soon. Quite simply, nonprofit public schools -- particularly community colleges -- offer a similar or better product for far less. While these community colleges don't spend anywhere near as much on advertising and marketing as do for-profit colleges, the public has woken up to the dangers of for-profit schools. With well over three-quarters of revenue coming from the federal government, these for-profit schools will be on regulators' radar for years to come. Cheaper and better competition has been eating away at for-profit schools' enrollment for the last five years, and this will likely continue. With thousands of other investment opportunities out there, I strongly encourage you to put your investment dollars elsewhere.